We want to be an open book. Got a question that you want to ask? Email us at: [email protected]. We may include it here on our FAQ's page. Be your most powerful you. Where are we located? 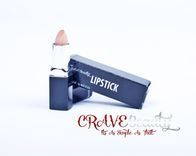 CRAVE Beauty is located in Michigan. Are we FDA complaint? Yes, we follow all rules and regulations set forth by the Federal Drug Adminstration. How do we ship our products? We ship by USPS (United States Postal Service). When was the company created? We started the ground work in 2010. Do we accept refunds? Yes. It's a simple 3-step process. Do we outsource manufacturing? Yes, we do use the expert services of a manufacture to help us comply with FDA regulations. Is shopping with us secure, and safe? Yes we do not sell, or share your information. We use PayPal for all of your secure transactions.